Credit union leaders are entering the planning season with ongoing concerns about what the interest rate environment will mean for margins and earnings, how consumer activity will impact savings and borrowing trends, and what the future regulatory environment holds. Business success is about balancing priorities and responding with the strengths of a design to match the challenges of a marketplace. Interest rate, consumer trends, and regulations are indeed an important aspect of credit union business, but what if this planning season leaders and board members considered the seven cooperative principles [see below] in addressing credit union challenges? Nationwide Mutual Insurance Company is running an advertising campaign that clearly articulates how it is different from competitors. Every television commercial includes some variation of the same message, namely that Nationwide Insurance:doesn’t have shareholders so we can protect our members first … puts protecting people in front of profits and empowers members to do what’s in their best interests … understands how important it is to give back to our community because we’re a mutual … exists to serve our customers and our goal is to make sure we all win. The Nationwide campaign is unusual in that it does not emphasize a product. The message is that the company’s sole goal is to satisfy those who use the company rather than satisfy a class of absentee stockholders. There are echoes of this message in the Occupy Wall Street movement. Under the slogan “we are the 99%,” the movement is trying to convey that corporations have lost their moral compass. Their only goal is to increase stockholder value and everything else —including caring for human beings — takes a back seat. It’s as if from their corporate offices high above Wall Street executives cannot see the man on the street, the people who make up the community in which these corporations function and without which they could not exist. The Nationwide campaign contains a bottom-up message. It is saying, in effect, Nationwide hears what customers are saying and has a corporate structure that allows customer desires to dictate corporate direction. The message is: We are here for you and only you. Martin Luther King Jr. said, “The arc of the moral universe is long but it bends toward justice.” Lately, the arc of economic life is bending away from the goal of solely increasing income-per-share to a goal that considers meeting the needs of individuals who participate. In other words, cooperative principles are gaining traction. Planning season is fast upon us. During this period credit unions examine their present and future and plot courses to achieve goals. As financial institutions, it is natural to concentrate on financial information and financial goals. But take care to hold in mind the primary purpose of a credit union: to operate for the well-being of members. 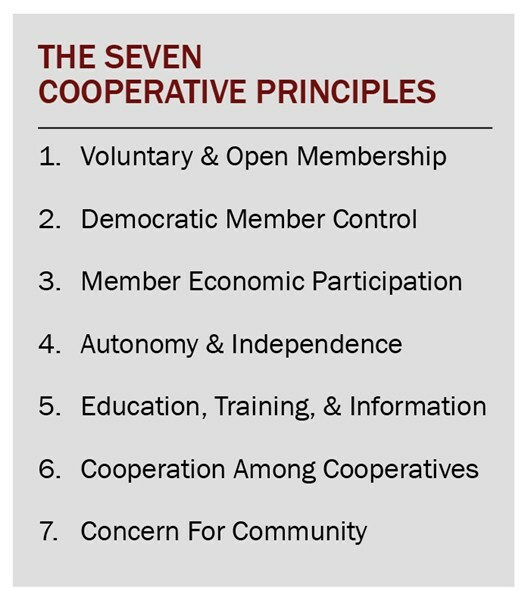 Cooperatives have seven guiding principles that are meant to create value for members. Planning season is not a time to look beyond these principles; it is a time to plumb their depths for ways to move forward. During a July meeting of the Credit Union Financial Services Partnership (CUFSLP), Callahan sat down with three Seattle, WA, cooperatives — outdoor recreation retailer REI, health insurer and delivery system Group Health Cooperative, and natural grocer PCC Natural Markets — to learn how they face challenges in their respective industries. Each has been confronting challenges to sustainability. REI faces pricing competition from non-traditional competitors such as Amazon. Group Health faces the challenge of new-yet-uncertain health care regulation. And PCC is continually challenged with the thin margins of the grocery business. Through these trials, REI, Group Health, and PCC have looked to the seven cooperative principles for guidance. Each institution believes adhering to the principles over and above simple bottom-line figures strengthens their futures. During the discussions with Callahan, four of the seven principles stood out as key ways these three cooperatives approached their futures. Credit unions would do well to take note. REI, Group Health, and PCC all value the second cooperative principle of democratic member control; however, Group Health goes to great lengths to stress to its members that the company is governed by them. It has opt-in voting, which the company says raises membership awareness of its democratic governance [for a Q&A with Group Health’s director of governance services, see page 4]. Group Health runs a vigorous process for attracting, vetting, and selecting board members. Forty-five people recently applied for four board seats. The applicants went through rounds of interviews and scrutiny before the Nominating Committee selected five candidates to endorse for the open seats. On its website, Group Health posts the charters of its seven board committees and organized local advisory councils offer input to the board. In addition, a Members Appeals Committee, which is comprised of two Group Health voting members and two staffers (ties go in favor of the consumer), reviews all appealed medical procedure denials. REI also makes concerted efforts to promote and publicize its democratic cooperative nature. Before its annual meeting, the company solicits comments and questions for management through its website. And the CEO makes a detailed report to membership on the cooperative’s status. PCC asks board candidates to post video statements on its website and encourages each to stipulate why he or she thinks PCC’s values are different from other groceries and what he or she would bring to the board. REI charges a one-time lifetime membership fee but offsets that cost by giving members a 10% annual dividend on purchases. The dividend amounts to a discount that in many — if not most — instances allows REI to sell items at a price lower than its competitors, hence an economic advantage that encourages member participation. PCC offers a monthly 10% discount on purchases and a 5% discount on purchases two days each month. Helping members and employees become better consumers and wealth-builders is a key principle that requires a concerted effort. REI rewards 140 employees from across the country with a four-day trip to the Seattle headquarters where the employees share their strategic ideas with executives. It also organizes meetings between young members and young employees to assure it is meeting the needs of the rising generation. Information, education, and training thus make for a self-reinforcing loop. Each of the nine PCC locations actively manages its own Facebook page and Twitter account to alert members about store discounts, events, local happenings, and key issues the grocer is working on, for example, its efforts in supporting local farmers. Like education, training, and information, Concern for Community does not arise spontaneously; it requires inquiry, research, planning, and sacrifice. But it is a principle both cherished and integral to the cooperative spirit. PCC operates a triple bottom line in which it considers not only economics but also social and environmental factors. It looks at how well it is doing on the financial balance sheet as well as how, over the past year, it has helped its community, people, and physical environment. PCC partly measures itself on how it has supported local food banks and how it has promoted environmentally favorable legislation. Group Health has a motto: “Quality, Affordability, and Growth.” It plows earnings above costs and state-mandated reserves into new medical and information technologies and facilities to improve the overall well-being of the community. In addition, Group Health’s board identifies medical care gaps within its geographic range and then sends teams to fill those gaps and dispense health education. The United Nations has declared 2012 the International Year of Cooperatives. So as you head into your planning season, make it a time to reflect on how your credit union is demonstrating its cooperative DNA. Study the seven cooperative principles [see sidebar] and reflect on how they can help set your course for the coming years. As Nationwide has shown, these principles are gaining traction among consumers. A fiscal bottom line is important, but it’s not always the brass ring. People respond to what the cooperative principles represent. Refresh your credit union, your membership, and your community with them. And remember, you are not alone in leveraging the power of cooperative ideals. Read also A Cooperative Outlook On Governance, an interview with Anne-Marie La Porte, director of governance services at Group Health Cooperative about how the cooperative principles guide the governance of her non-profit based in Washington state.